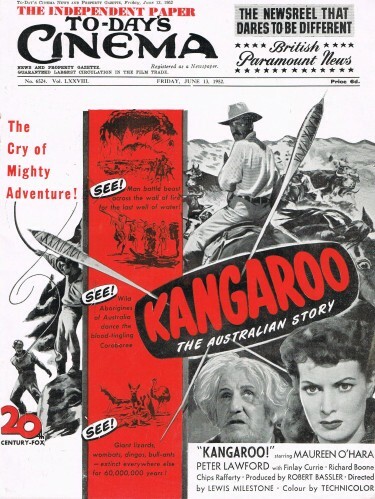 » Blog Archive » Kangaroo – Australian Western ? Kangaroo – Australian Western ? Some films of whatever age seem to remain well known and popular and are quite often on TV. However this is NOT one of those – it is not easy to find and at this time I have never seen it. The cast has Peter Lawford, Maureen O’Hara, Chips Rafferty, Richard Boone and Finlay Currie so a veritable Whos Who of film actors . 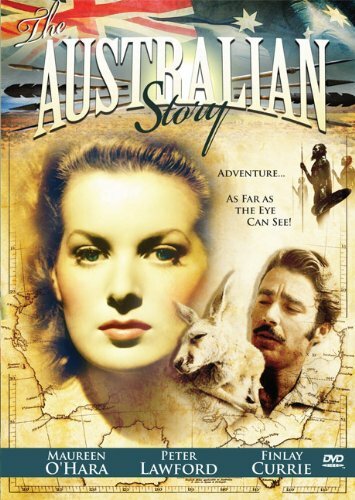 The story line concerns the fortunes of an Irish immigrant Finlay Currie and his daughter Maureen O’Hara in rural Australia. This would have been a long trip for Maureen and following this film she travelled back to her native her native Ireland to make The Quiet Man with John Wayne – what a good film that was. Richard Boone, of course, plays the bad guy and Peter Lawford provides the romantic interest. Aussie character actor, Chips Rafferty has a role on his home soil. Lewis Milestone directs and the film is in Technicolor. The film was also known as The Australian Story. Maureen O’Hara actually fought to get into this film according to her memoirs and then regretted it. She liked the original script as a straightforward Aussie western but much of the story was rewritten by Lewis Milestone, the director. To quote Maureen from her autobiography ‘It was the worst piece of rubbish I had ever read’. Whilst she hated the film she loved Australia and the Australians who were very kind. The same could not be said for Richard Boone and Peter Lawford who were horrible to her. The two of them had been involved in a scandal up in Sydney not long after they arrived where the press had followed them to a brothel but this incident was kept very quiet after some negotiations. Maureen states that most of the film was made in the outback near Port Augustus with the temperature most days around 105 degrees. Apparently the scenes in the Australian outback are nicely done but at the end of the day the film was described as ‘ just an average western set in the land down under’. She got back to Hollywood in March of 1951 after 5 months of filming. The next Hollywood production shot there was The Sundowners and while star Robert Mitchum had his problems with the Aussie press also, The Sundowners is a much better film than Kangaroo. Kangaroo made its debut before distinguished audiences at gala charity previews in Canberra, Sydney, Melbourne, Adelaide, Brisbane and Port Augusta (S.A.) . It had been “Two Years in the Making” so said the publicity machine. Filming Locations:- Buckaringa Gorge, Catninga, Flinders Ranges, Quorn, Sandy Creek, Port Augusta, Woolundunga Station, South Australia; Pagewood Studios, Sydney, The Rocks, New South Wales, Australia. Just a thought on this – around the same time the British made a South African set picture called ‘Diamond City’ with David Farrar and a very young Diana Dors. Much of the film was made in England in the studio but there was also quite a lot of location filming. I always remember that my Mother and Dad had bought me a jig saw puzzle for Christmas of Diamond City – that is something that is a lovely memory for me. I have never seen such a puzzle since. If anyone out there has one I would love to know. Thank You.